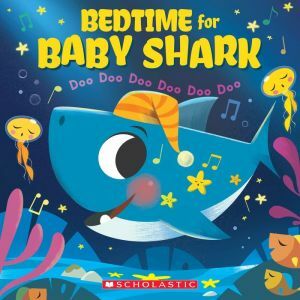 Sing and dance along with Baby Shark as he gets ready for bed in this playful song and story -- the follow-up to the bestselling picture book! How does Baby Shark get ready for bed? Brush your teeth! Doo doo doo doo doo doo! Take a bath! Doo doo doo doo doo doo! Read a book! Doo doo doo doo doo doo! Sing, dance, and read along to this brand-new bedtime song, featuring Baby Shark, Mama Shark, Daddy Shark, and more underwater friends. Kids and caregivers alike will delight in this silly illustrated story of a shark family's bedtime routine, full of funny, eye-popping illustrations and a catchy tune you won't be able to stop singing. Also features helpful picture guides so readers can dance along, act out the hand and foot movements, and develop their fine motor skills. By the end of the story, little ones will be laughing, singing, and dancing their way off to sleep with this charming and catchy read-aloud! Are you ready to help Baby Shark get ready for bedtime?